Silica - Milagro Rubber Co. Milagro Rubber Co.
Silicon Dioxide (SiO2) is a white, high purity, tasteless, odourless, easy dispersion, chemical powder produced by the precipitation of sodium silicate with sulfuric acid through hydrolysis. Our products can be used in food, cosmetic, pharmaceutic and agricultural sector, as an anti-binding / anti-caking agent improving the end-product properties and characteristics, benefiting and optimizing the manufacturing process. 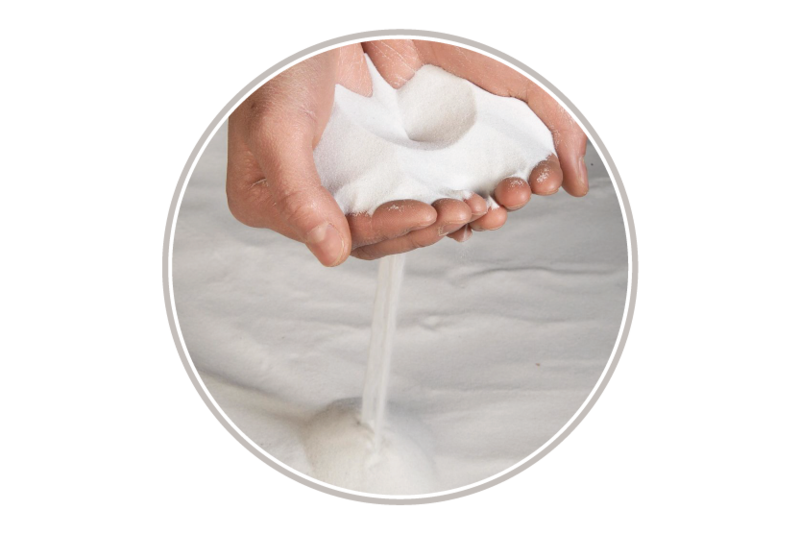 Our food grade silica is used in the manufacturing process of milk products, flavoring, seasonings, condiments, sugars, salts, etc. As we set the highest standards, we have seen the need to bring the highest quality techonology and development. Our team of highly qualitified specialists in raw materials allow us to cover on various industry sectors. Our goal is to be best option available in the market regarding quality, price and service. Kaolin due to its characteristics (whiteness, particle size) gives the smoothness and gloss paint to the surface, improves durability and reduces the same amount of pigment. In rubber manufacturing, the Kaolin is used as load that increases the hardness and durability. Used as a loadging agent and paper covering. In paper finish, wall paper and corrugated cardboard. Reduces visible pores and makes surface shine. Used in the production of bricks and blocks, also used in high alumina bricks. It also makes it Acid resistant. Used in clay boxes to cook in fine pottery. Used in toilets, electric porcelain, china and Tupperware. Used in the production of glass. Used in the production of paint extensions and taints. Used as dilator because of its chemical inertia, fluidity, easy dispersion and not being abrasive. In water based paints, oil based paints and silica based. Used in surface paints, improves durability and reduces amount of pigment needed. Used as stuffing for rubber plastics and in filtration processes. Plastics coverings for ducts. Mixes well with plastic resins and improves stiffness. It is part of the production process of pesticides and insecticides. Used in the production of medicines because it is bacteria free. ** (This product is not available in Mexico).